This lavishly illustrated soft-cover book contains over 500 pages of tactical and strategic advice. Novices and veterans alike will improve their Memoir ’44 play thanks to this guide’s use of core principles to understand and retain key concepts; and the careful study of the 139 scenarios and 4 annotated games included in the book. With this guide, you will learn to read the battlefield, effectively maneuver troops, anticipate opponents’ moves and gauge their relative strengths and weaknesses; as well as discover how to manage the medal count and control the flow of the game – all keys to victory. The book’s author Alexis “Praxeo” Beuve is both an experienced Memoir ’44 player and a well known author and editor of numerous strategy books on “classic” games such as Chess, Go and Poker. Preview the Table of Contents and read a sample chapter by visiting the Tactics & Strategy Guide web page. You can pick up a copy from your local game store or order one now from the Days of Wonder Webstore. 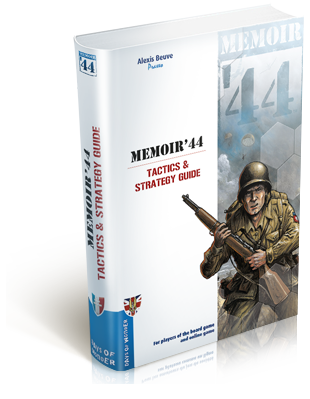 This book is a supplement to the Memoir ’44 Game System and requires the original board game, but the book also includes references to many other Memoir ’44 expansions. This entry was posted on Wednesday, October 29th, 2014 at 10:51 and is filed under Games, Memoir'44, News. You can follow any responses to this entry through the RSS 2.0 feed. Both comments and pings are currently closed. What is the price of this book, please.